this is an easy article about a nice subject: the very well known After Eight chocolate mints. Also the Elementary Students can reply correcting these sentences as a comment. Choose a few of them with the aim of practicing formally correct English. First say no and what's wrong, then write what's right. Very short sentences, subject, verb, complement. 1. 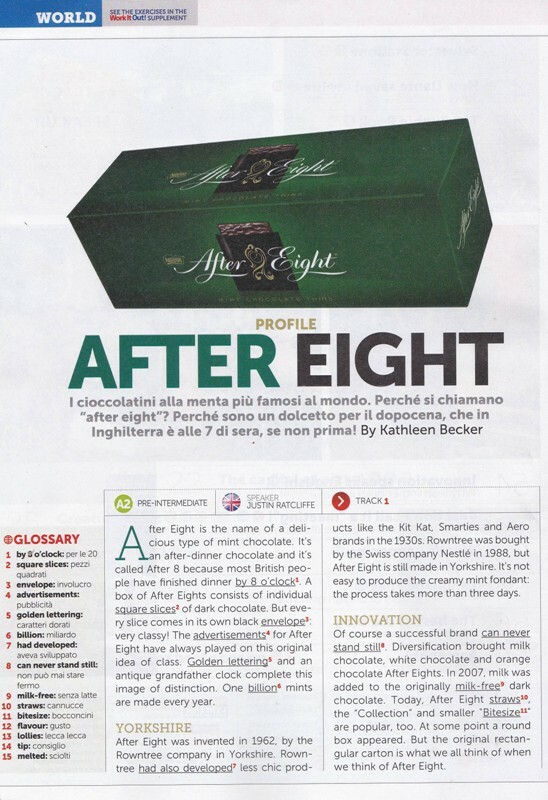 After Eight is the name of a famous milk chocolate. 2. It's an afternoon chocolate dessert. 3. Most British people have finished dinner by 7 o'clock. 4. In a box of After Eight you will find individual round slices of dark chocolate. 5. 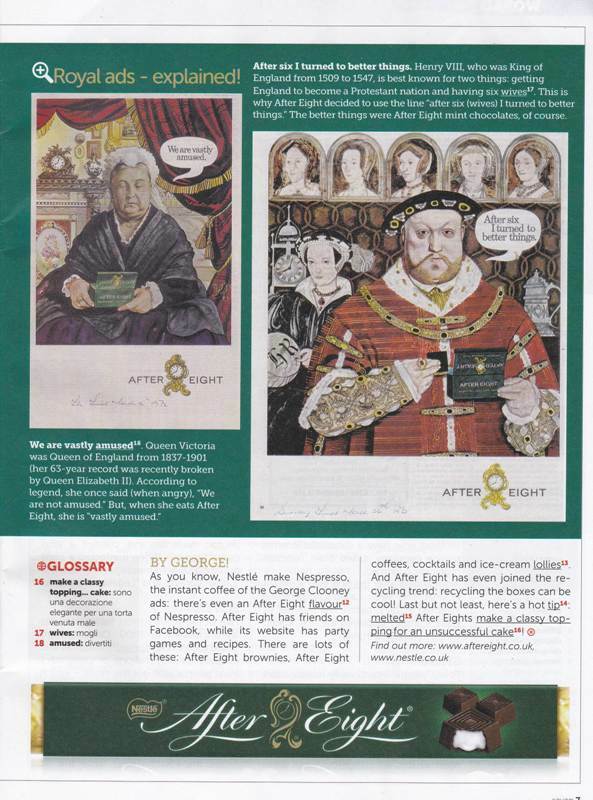 The ads for Efter Eight emphasize the idea of an ordinary product. 6. After Eight was invented by Nestlé in 1962. 7. Rowntree has also developed more exclusive products such as Kit Kat and Smarties. 8. Melted After Eight make a freat topping for successful cakes. Do you know any other famous chocolates useful to practice English? Why? Eleonora: After Eight capital letter; of the advertisements. 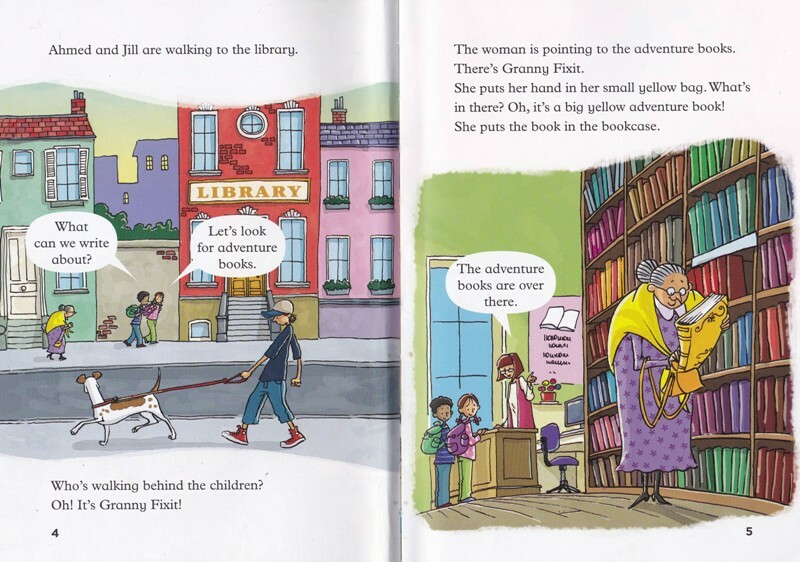 these are the first pages of the adventure book our young pupils are reading, from last to first page. As homework for all of you and whoever wants to participate, here's the beginning of a parallel story we decided to invent to see where it may lead. Don't forget, what works with children works with adults too! Also Prof. Simon Sweeney from the University of Leeds says that. "Camilla, Greg and Gabriel are sitting around the table in Gabriel's kitchen. Suddenly the clock on the wall stops; then the hands run faster than before and they break the glass to start running on the table. "We are tired of turning, we do not want to continue!". To start the time again they have to be replaced and ....................."
How would you continue the story? Bear in mind it is an adventure! Adults can contribute to children's work with their ideas. And you, children, everybody is waiting for your story to read! 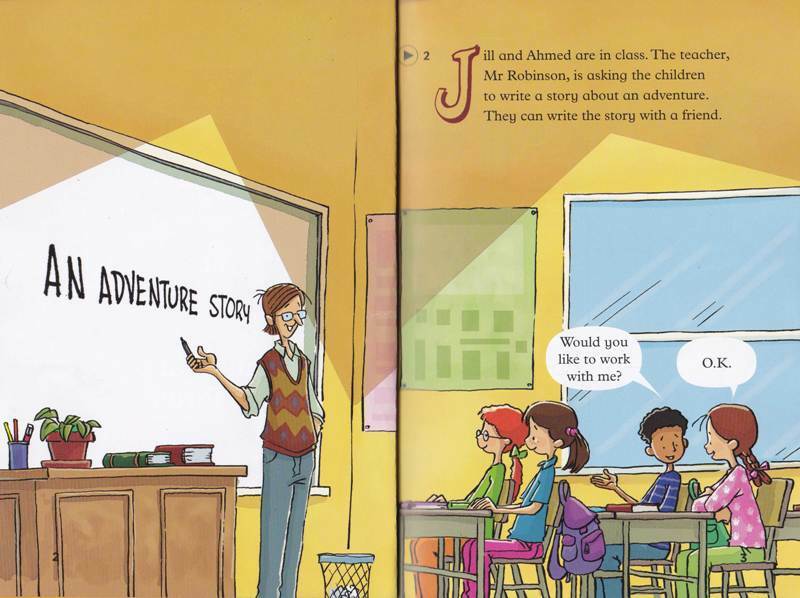 We are also continuing the story with Jill and Ahmed, of course. this is the page for the Elementary groups that we started studying in class and we didn't have time to complete. Please for next time read it carefully and write a similar letter to someone you know, speaking about your class. Divide your writing into paragraphs and make them correspond to Danka's letter. It will be easier for you to be formally correct. Then read it aloud and start telling it without reading any more. As far as we are elementary students, it's much better to follow patterns, and Danka is exactly like us, a student of English as a second language; her English is perfect. Do the same to become familiar with the language and develop your writing skill time after time so to consolidate your competence and have the capability of reemploying it also orally. Ask any questions you may need and upload your letter as a comment. 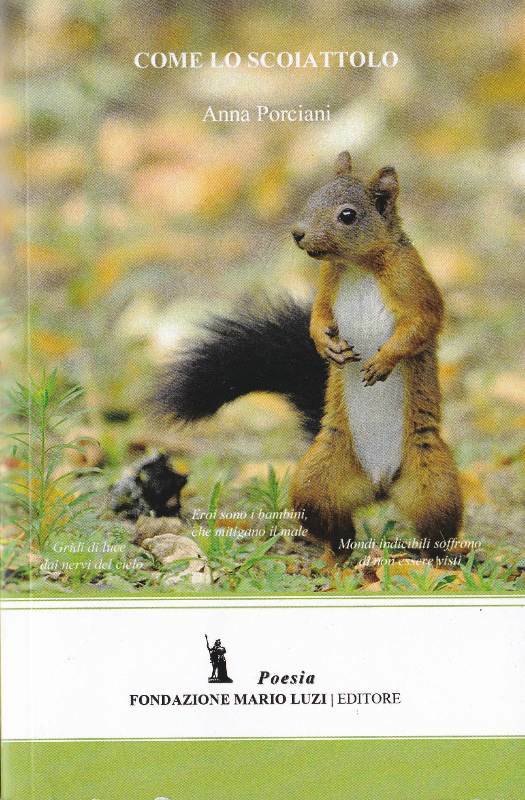 These days I'm going around with copies of the "Squirrel" mentioned below, in my car, in case there's someone who wants to support our NPO and its projects, offering the book as a present to a friend or anyone else. Massimiliano: very good job! in a class, singular; thirty students; they are all Italian; I live with my wife in Cecina. Francesca: very good email! English and all nationalities need capital letter; at UP, no article; psychologist then punctuation; safety, I, subject pronoun, always capital letter. Gianluca: very nice letter! Nationalities with capital letter; at Università Popolare, capital letters, no translation; Silvana is a ...Safety technician; Francesca has a cat, his/its name's; remember punctuation, including commas. Annapia: my suggestion to everybody is to follow a pattern, i.e. Danka's letter above, for an English-style writing. You can adapt the pattern to your situation. Christmas holidays plural, they pronoun, aren't going well. Rest/stay calm, live peacefully; is this fine to express your ideas? It won't last forever. These ideas are too difficult at our level, use present simple and focus on formal correctness and accuracy. I can't understand this last line, I present etc. The tense should be present continuous, we haven't studied it yet. 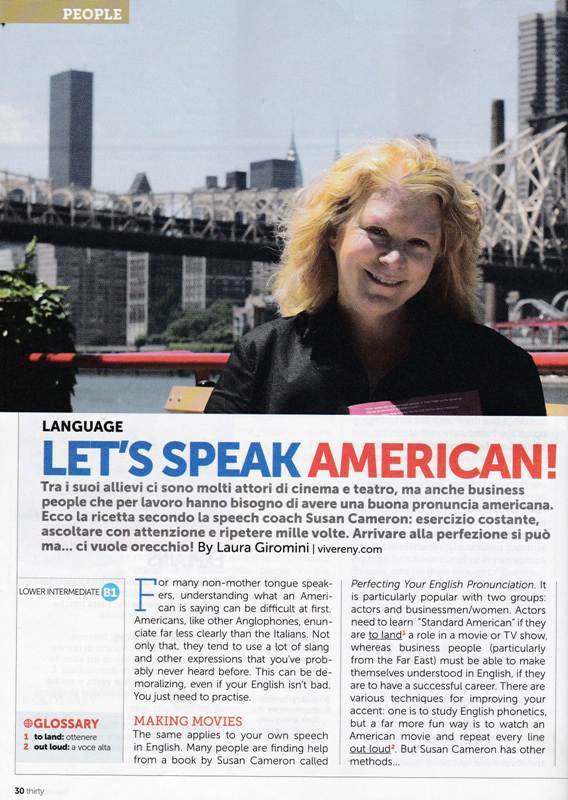 Soon, adverb, not son noun; greeting etc is a translation from Italian, but it is not English. Have a look at Danka's letter again. When speaking and writing at elementary level, you should be like English people at that level. Use your elementary English studied so far to be like them. Fabio: I'm writing, present continuous, a tense we haven't studied yet. Danka writes, here is an email etc; because; my English isn't enough, refers to quantity; you can say my English isn't good enough, referring to quality; she's very nice and a very good teacher, using the indefinite article for countable nouns; small; greeting dear embrace, have a look at what I wrote to Annapia; use simple English expression to close an informal email. Silvana: UP no article; he is plus indefinite article for a countable noun; after exciting, punctuation; some restaurants are expensive; walking. Good job! Pina: very well done! Continue, choosing another page on the blog and writing other comments! Nicola: very nice email! Except for a few/very few; he works for a computer company that makes...; Cecina is a small town. Annapia: I heard you are not feeling well; your daughter will care well; I will tell the teacher and the class about you. Best wishes to recover soon to Maria Grazia then, by all of us! Vincenzo: you've done a very great job, Vincenzo, the same you're doing in class. Continue practicing, paying attention to any single detail, and I'm sure you won't have problems any more with your English very soon! Do not forget, nationalities need capital letter, then Italian; she is no apostrophe, or contracted, she's; because I am not very good at.... speaking, performing, English, or my English isn't very good. I wouldn't say that, continue choosing another page and upload your comment replying to the questions. 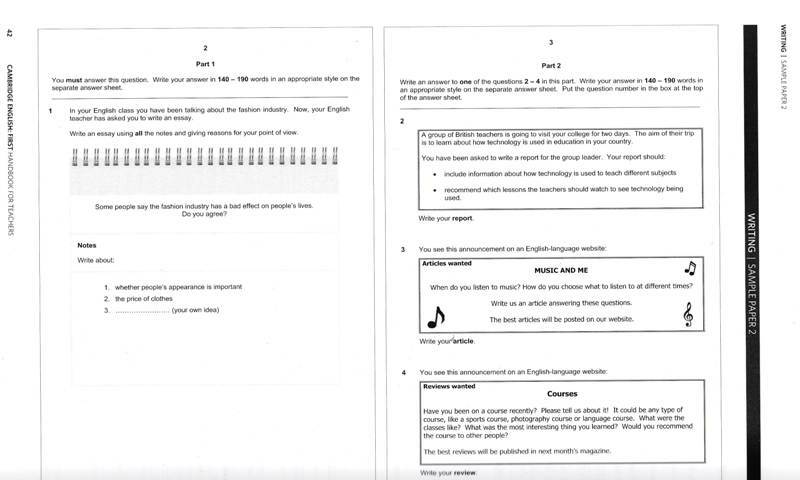 this is a page for those students who have to prepare the First, the level B2 examination developed by Cambridge English Language Assessment, part of the University of Cambridge. To spend on targeted purposes the time between classes, we selected a page from the teachers' handbook to practice writing. and Language, vocabulary and grammar. Write your essay and answers here as a comment to let us read them before our next meeting. When in class, we'll compare your written productions with the ones in the handbook, reading the examiners' comments. 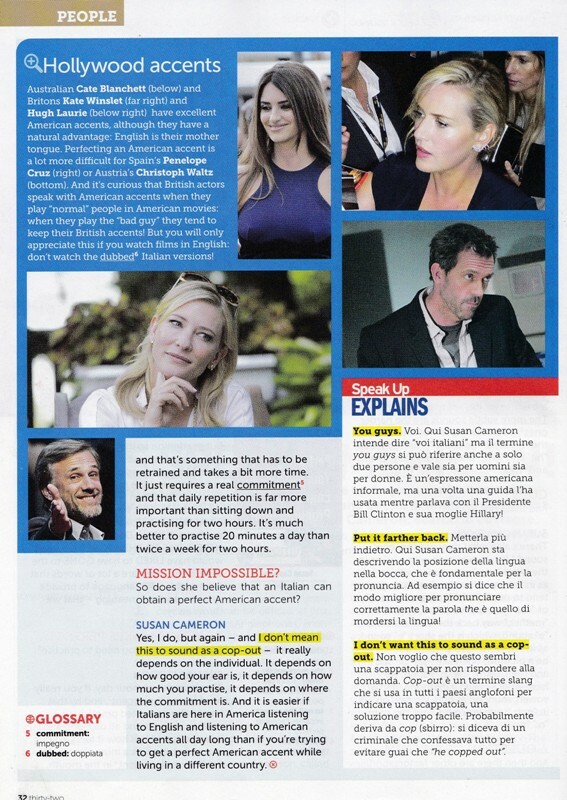 There is also an article from Speak Up, the magazine for students of English we hope can meet your interest. This is written comprehension, reading, before listening to the English speaker in class reading it. We'll talk about the main points. 2. Write short sentences with subject, verb, complement, then start a new sentence. 3. When connecting sentences with linking words, e.g. but, keep in your mind the coherence of your text. I met, past simple, but I didn't know her yet? 1. On plus date. Why choosing last? 2. The professors Definite article here, those ones not in general. 3. In which .... go plus to, believe plus object. this is English practice for everybody, including beginner students, making buiscuits too. It is a page for families, children and adults to have fun together. Never forget that what works with children works with adults too! 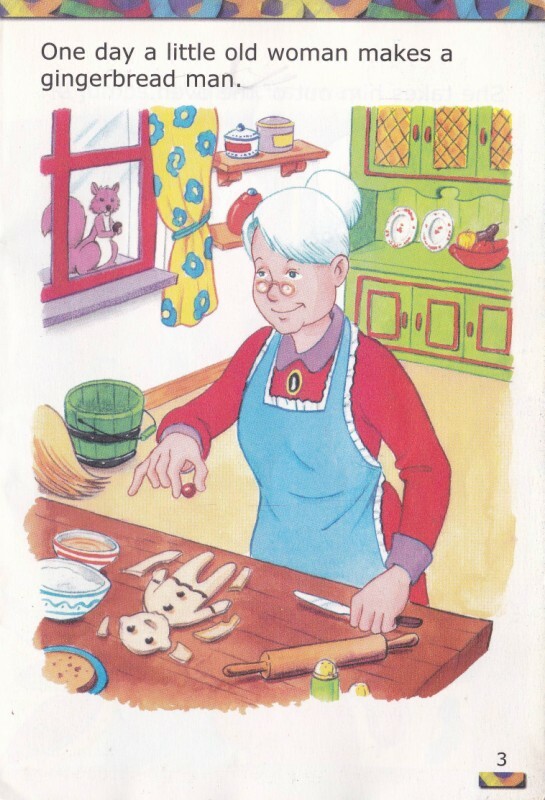 First: if you do not know the story of the Gingerbread Man, find it on the Internet and listen to it watching the videos. There are American and British versions. Then remember it. Second: write it down as a comment using only present simple, subject, verb, complement, and come to class ready to say it with your mates. 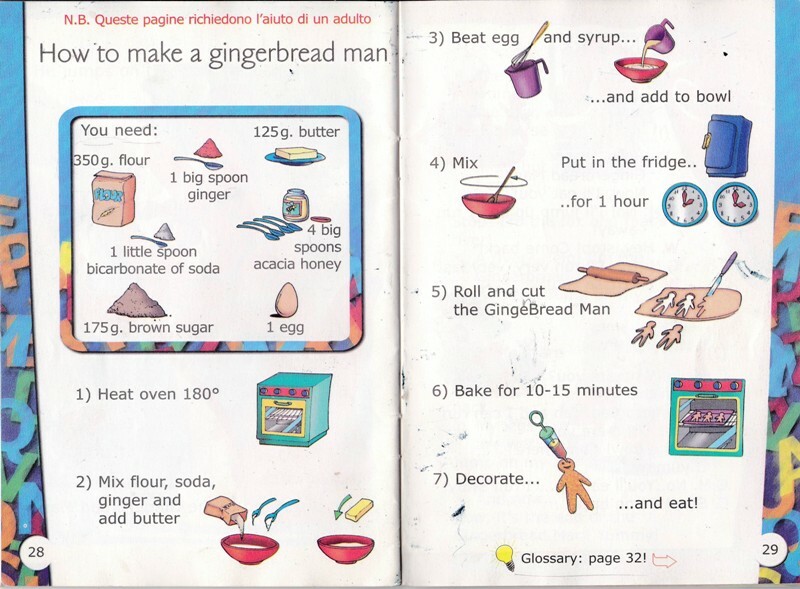 Third: read the recipe to make a Gingerbread Man. Fourth: make your Gingerbread Man very expressive the size you like, deciding the best position of its head, arms, hands, legs, feet. 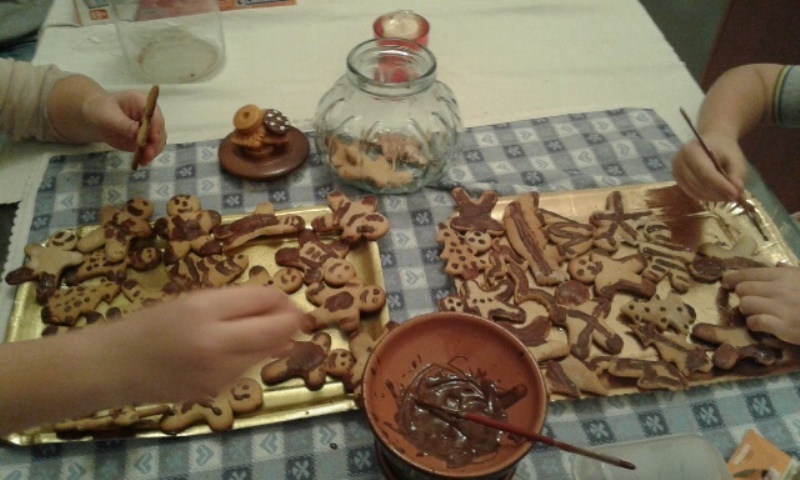 In class we'll paint it with chocolate, according to each one's fantasy, and the best buiscuit will win a prize. We will decide together when coming to class with all our buiscuits. We will take a photo of all of them, when painted. 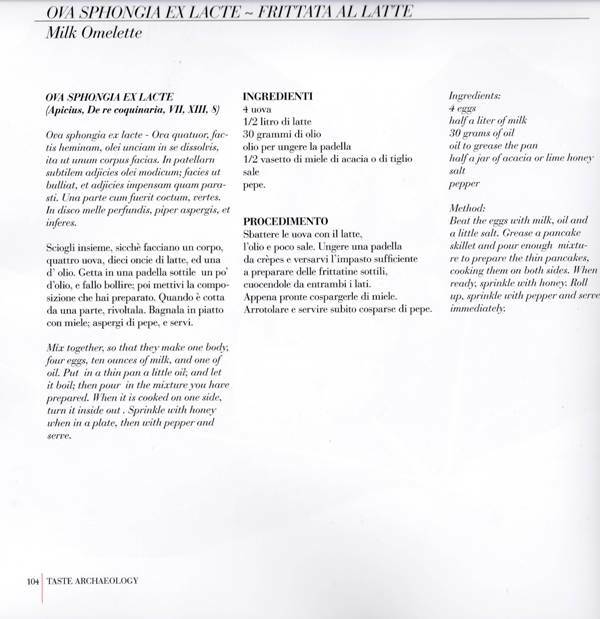 Have a look also at page 3 article number 8 about chocolate, a very interesting subject. See you in class, enjoy your English! 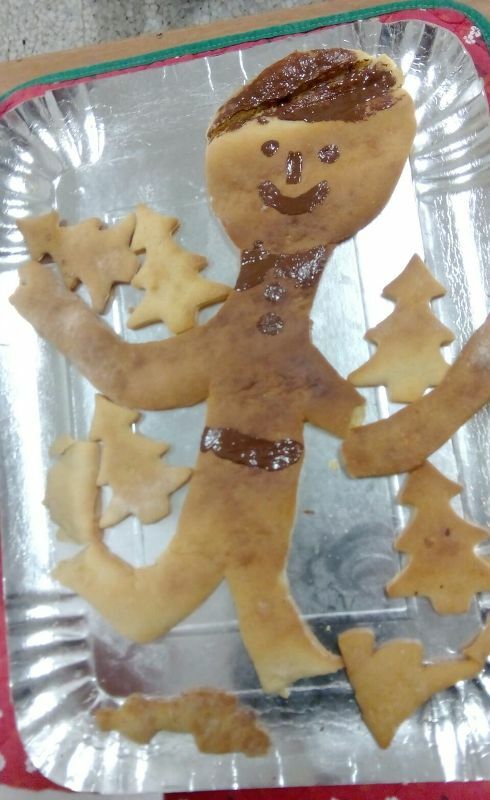 Eleonora: information singular, an old woman prepared, her husband, when she baked it object pronoun, the gingerbread man (it subject pronoun), jumped. As you can see from these photographs, everybody, children and adults, enjoyed themselves painting the Gingerbread Men with chocolate and eating them. 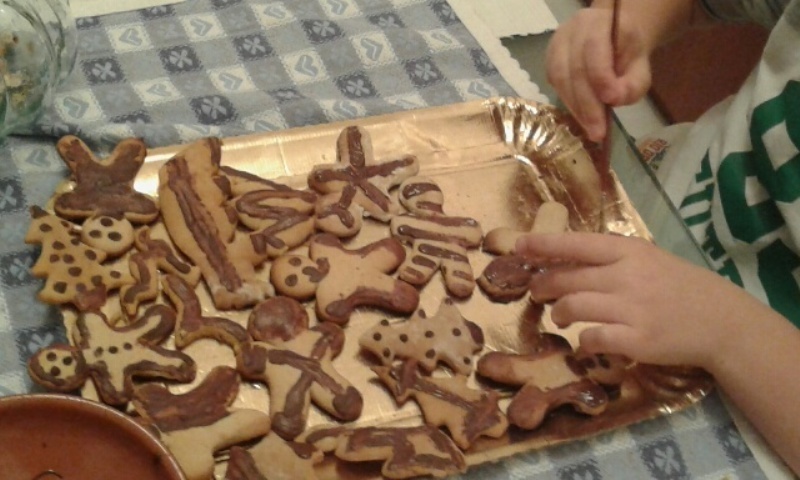 In the class for adults, two painters are decorating the biscuits, while in the one with children, Gabriele and Camilla, both nine, are doing an excellent work with the well shaped, little biscuits baked by Camilla's mother. Thank you all for your contribution and never forget that the more you behave a language, the more real it is and becomes yours, one more identity to be added to the one/s you already have. Annapia: finally you did it! this is a new page for all the students who are coming to class next week. Have you ever thought to resemble some wild animals? Is there a wild animal whose characteristics you like for any special reason? 2 likes people who give it food? 3 likes to look good? 4 doesn't live in Britain now? 5 likes to live in a big group? 6 can't remember where its food is? 1 Which of their features are positive and which are negative? 2 Which lifestyle attracts you most? Why? 3 Talk about your family and your friends. Which animal are they like? 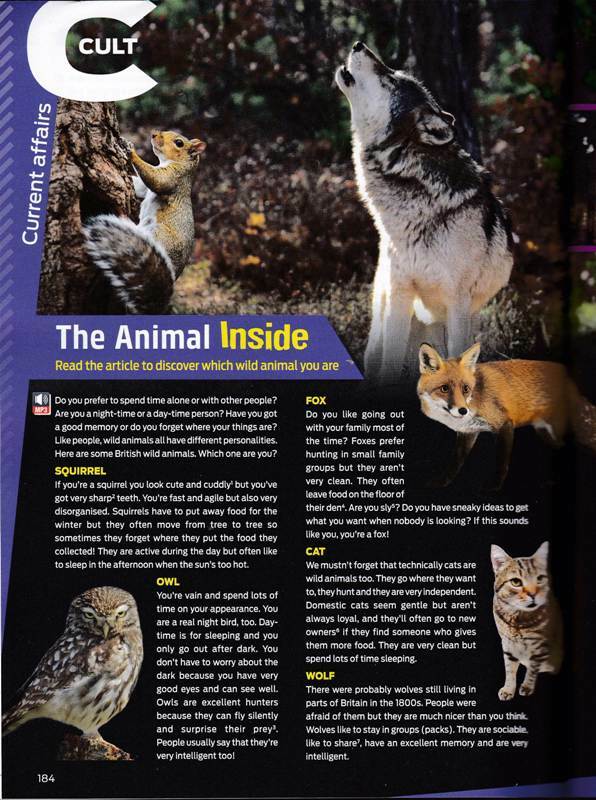 Compare this page with the one about "Wolves and a richer life", going to page 4, article 11. Vincenzo: so unexpected finding out what animal you think you resemble. I will better ask you in class. I subject, capital letter. Correct short answer, Yes I have. 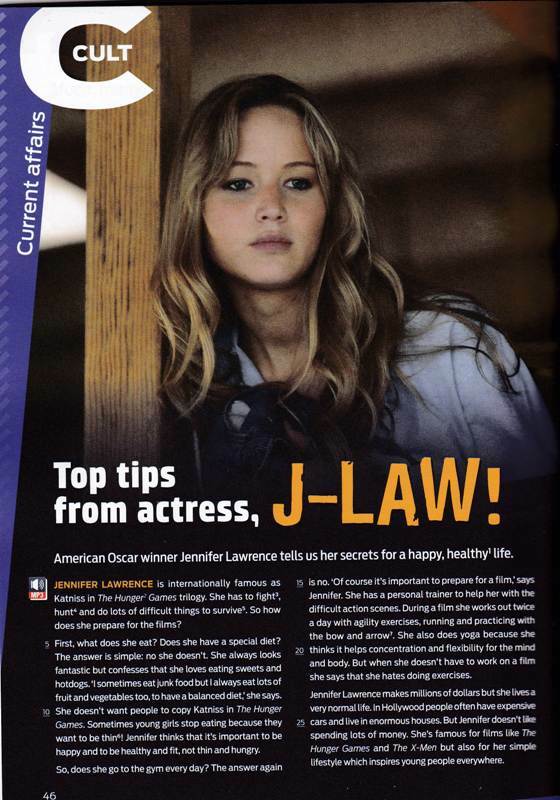 Before a vowel the article a becomes an. Because it has, it is the pronoun for animals, unless they are domestic animal. In this case, if you think you are like an elephant, the pronoun could exceptionally be he. The Owl has a good eyesight. Britain capital letter. But it did in the 1800s. The wolf likes living in a big group (in this case the group is called pack). The fox lifestyle attracts me because it lives in small families. Vincenzo, I dare say you worked quite well, thinking a lot, and writing very interesting comments. Continue your job. The more you practice choosing what you like doing, the better your writing and speaking skills will be. The animal inside: thank you for this very interesting comment! I read the book many years ago. Plural of woman is women, who read, found. Punctuation helps the reader, after woman, period. She has the same character as, third person simple present with s, Jungian analyst, how women period. In "Women who etc" since it is the title of a book. archaeology is within us as a great resource to explore. If we don't know what happened before us we can't know what we are. Food too is included, we are what we eat, aren't we? 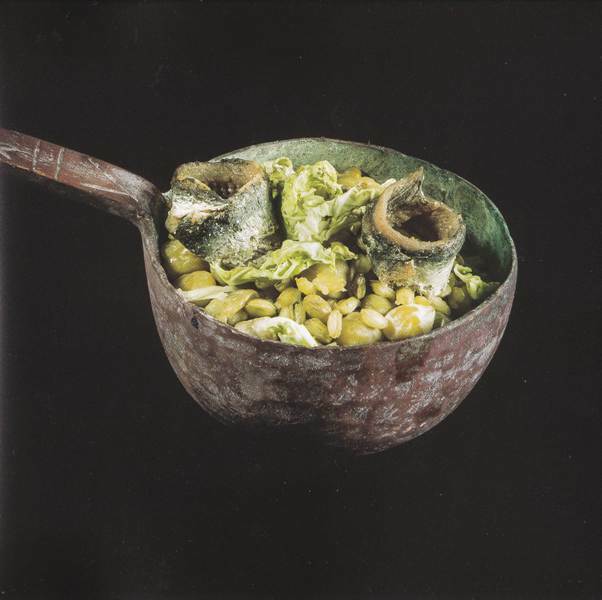 The more we know about food, the more we know about ourselves. How often do you have guests at home to share meals with? What is a successful menu of yours? 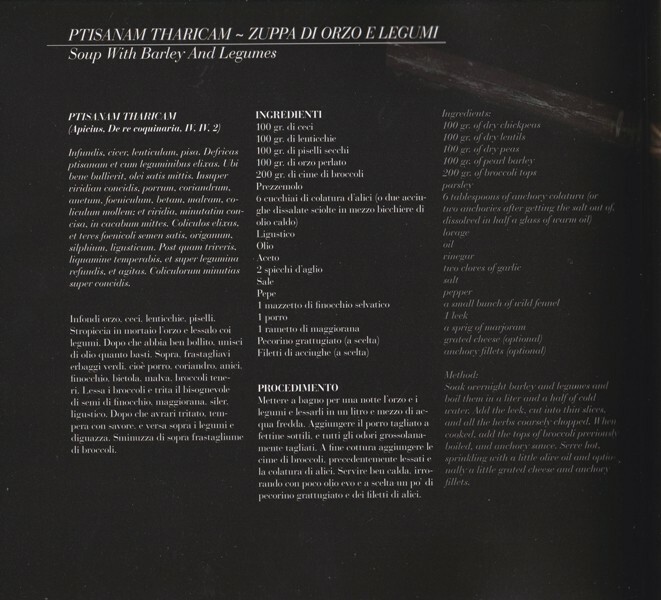 This book - we translated - is about Romans' empire, civilization, culture, society and cookery. 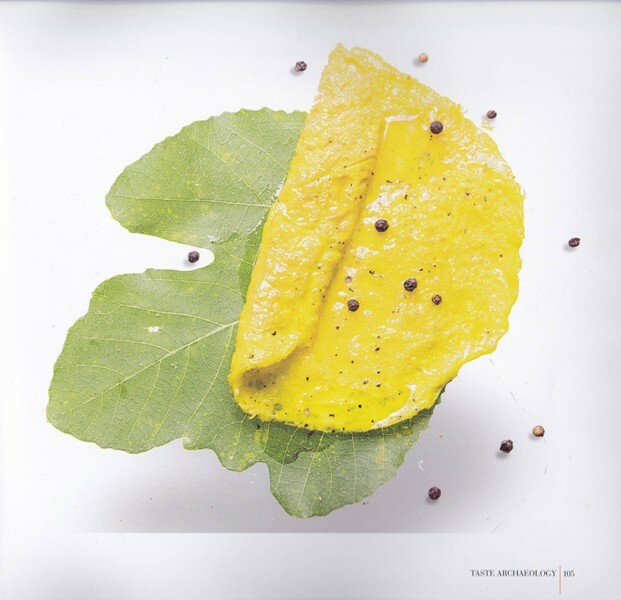 Interesting texts, beautiful pictures, delicious recipes, elegant design. Be curious, find it on the Internet and study it, then offer your guests unusual recipes. The two ones you find here and you can try are a possibility to create a connection between you and a people who influenced also British developement. So many remains are in the language too. Can you think of Latin in the English language? How many samples do you know? Why don't you write them down here with your comment? 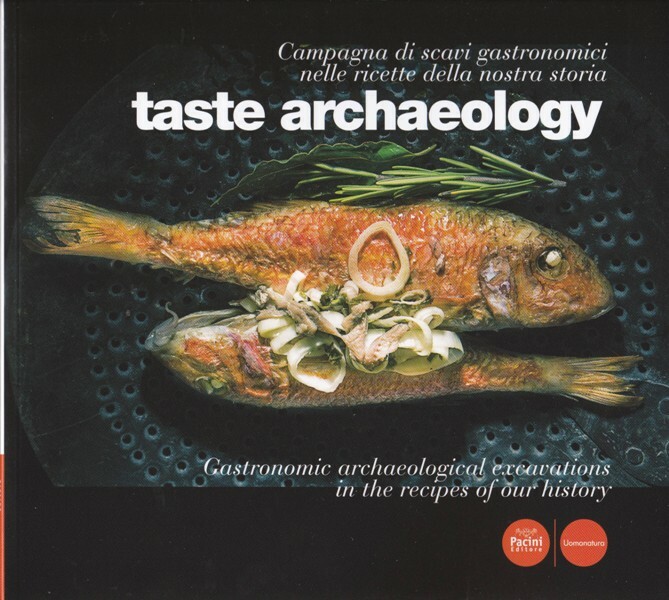 Thank you for contributing to our "language excavations" in addition to the gastronomic ones you can read about on the book. 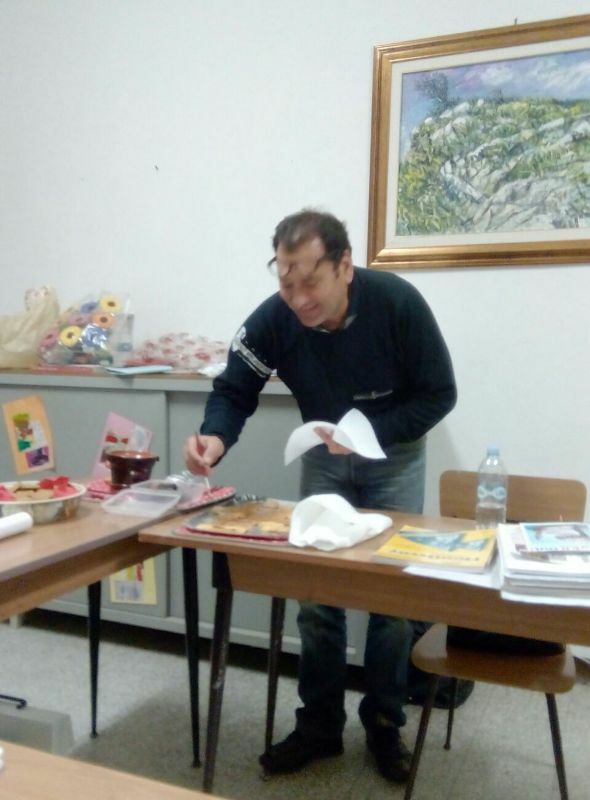 Thank you Giuseppe for your contribution, we are going to invite a few more students to partecipate in giving the answers. We'll see what happens. What is the role played by food in your life? What is the role of food in a healthy lifestyle, according to you? What type of food should you eat? Have a look at these two pages and reply to the questions as a comment. We will talk about that in class; after reading write down notes, come ready to talk and ask questions. Pay great attention to formal correctness. this is the third stage of our work on the website. Replying after your comments. Please consider that what is said referring to a comment and that is in common with others, is not going to be repeated, so to encourage you to read all comments and take advantage of your mates' writings. Emiliano: check singular and plural, tenses, think English and simplify your writing. Be concise and direct, aiming at formal correctness with just subject, verb and complement. Check prepositions. Adjectives before nouns in correct order. Nicola: would you correct...when speaking in general, no article before nouns. Types of food... in a balanced diet, countable noun; first subject pronoun, capital letter, I.
Maria Luisa: please write down a little more. Fernanda: prepositions, pay attention to..., comparative with short adjectives adding er, easier, playing a role in, better no possessive adjectives when speaking in general. Paola: of all foods; when referring to daily habits, the tense is present simple; use punctuation and start frequentely new srentences; Orange jam is marmelade in English; you eat bread and drink milk, you have both; Before singular countable nouns,indefinite article; food is an opportunity, creates the opportunity, gives you the ...; position of adverbs, I especially like...; role in a healthy lifestyle; in my opinion is quite formal, I think is more informal; check orthofraphy. Sergio: possessive adjectives are very common in English when speaking about ourselves, my family; like plus ing form; without exceeding; rich in; animal protein, when nouns have the role of adjectives are singular. Claudia: In Italy lunch time is also the occasion; Mediterranean capital letter. Giuliano: answer 2, check the subject. Francesco: pay attention to prepositions and tenses. Emiliano: I subject pronoun, capital letter; choose between for and two, not together; English and all nationalities capital letter; movie, no double o; it is, subject needed if referring to English Extra, otherwise other subject; four guys, plural, no s with the verb; together spelling mistake; short is an adjective, no s for plural; actors plural subject no s with the verb; easy is an adjective, easily is the adverb; funny's? Thank you spelling mistake. Vincenzo: 1. I subject pronoun, capital letter; a, singular, with habit, singular. 2. I drink much water; 4. eating many. After reading Francesco's comment, what do you think of the role each one can play to resolve the planet's problems? Thank you all for contributing with your very useful comments. 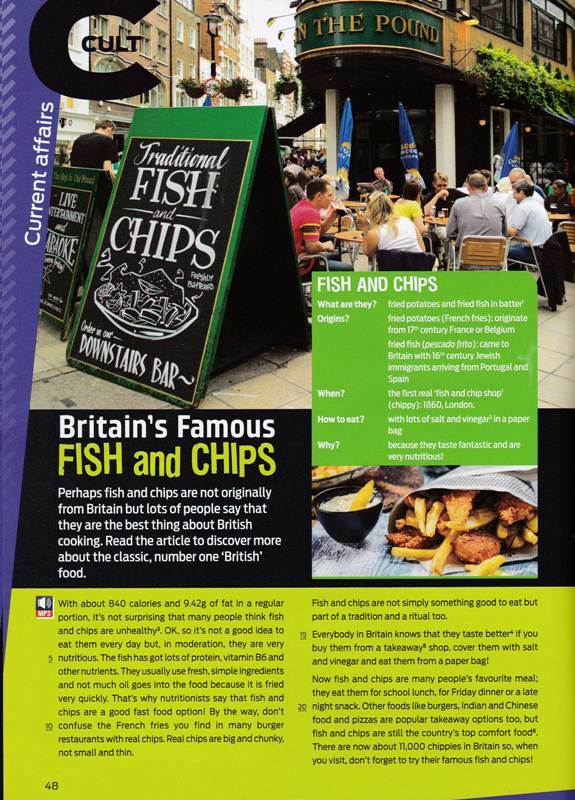 Come to class next time ready to tell us quite briefly about fish & chips. Choose a page you like on the blog among the so many there are, and start preparing a very short speech, 60 '' to present it and say your own ideas. how do you pronounce the word privacy, so common in Italian too? Quite likely the procunciation you adopted, like the majority of people, is the American one. There are many differences between British and American English, and many more if you consider English spoken by Australians, New Zealanders, Canadians etc. What's intriguing is developing strategies to become familiar with as many accents as possible. Suggestions? Watch films with no dubbing, and appreciate English spoken by actors with their many different accents and beautiful voices, read books, enjoy them with friends, your children and become aware of your progress, time after time. Write down notes, compare impressions and ideas, let the language do its work, that is to open your mind and your heart while you have to do the same. Come to our classes. Choose films and books that you like and love what you do. Create a bond with English and find time to practice it with other students and native speakers, travel. 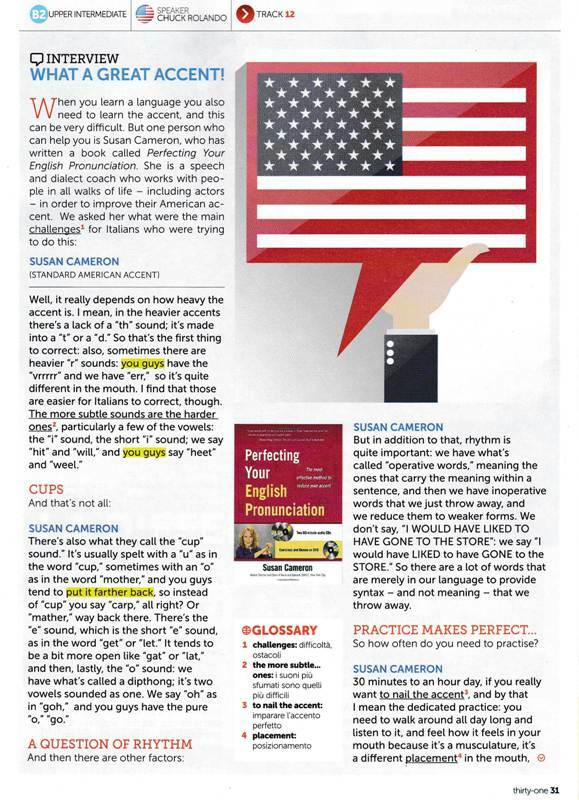 Having a perfect pronunciation might not be the point, but what's fundamental is understanding when people speak to establish a proper interaction, communication, and in order to achieve this abjective you need to train yourself, the same you do when practicing a sport. What is your experience with English? Are you better at performing one of the five skills? The five skills involved in acquiring a language are aural comprehension, ie listening, written comprehension, ie reading, oral production, ie speaking, and written production, ie writing, plus interacting with English speakers. 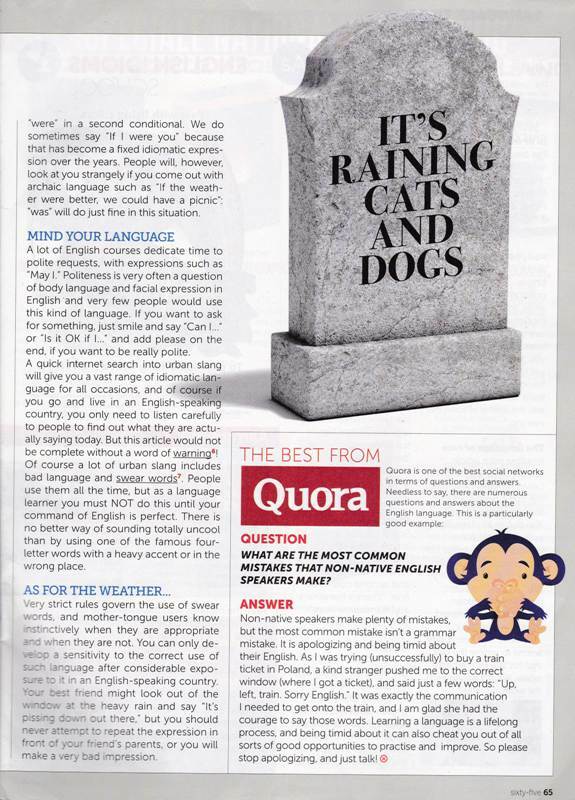 What else is a language? If you are a false beginner in your studies, build up short sentences with just subject, verb, complement. Do not worry about mistakes, making them ias a way to learn. I studied English when I was at school 50 years ago. My teacher used to teach/taught us grammar (no passive form) without practicing conversation. I would like to develop the skills of listening comprehension and interaction with English speakers. I hope that despite my mistakes I will be able to learn. Of course you will, Stefania. Interest helps to convey appropriately attention to formal correctness and accuracy. this is an easy reading article mainly for you who are ready to begin studying English, waiting for the groups to be complete. Anyone else who wants to practice English and participate in our blog is very, very welcome with comments, answers and questions too. Do you know of any similar festivals in Italy even if much, much smaller? Where are vthey? Have you ever been there? What do you usually do when you go to festivals in the open air? 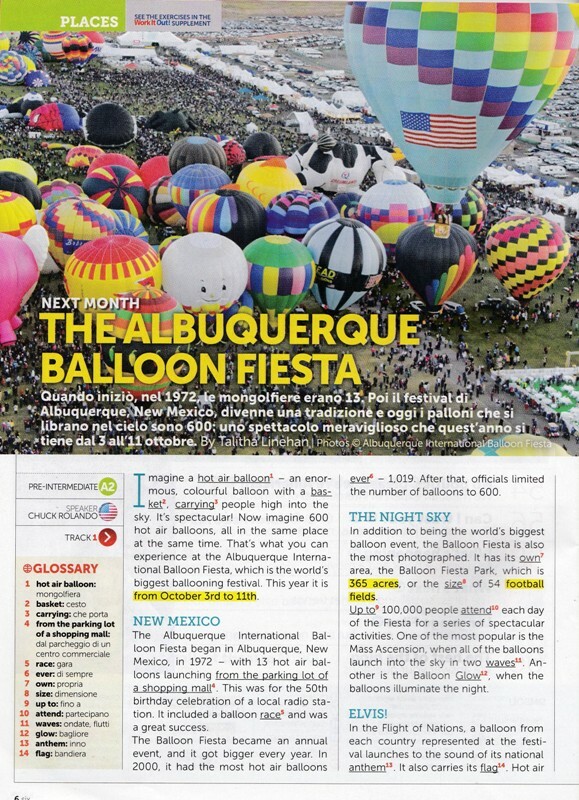 In just two days this "Fiesta", or festival is going to start in Albuquerque, New Mexico. Is there anyone who has ever been there? What are the most spectacular activities? Say something about the balloons' different sizes and shapes. p.sw. we do hope there are no problems with creating accounts like last Summer. Try and enjoy your English! Giuliano: to rise in the sky, flying, flight. after enjoying working in class for four weeks, we met cruisers "In the open air", the square in the city centre where the shuttles from the port leave cruisers before they set out on their trips to visit Tuscan cities. 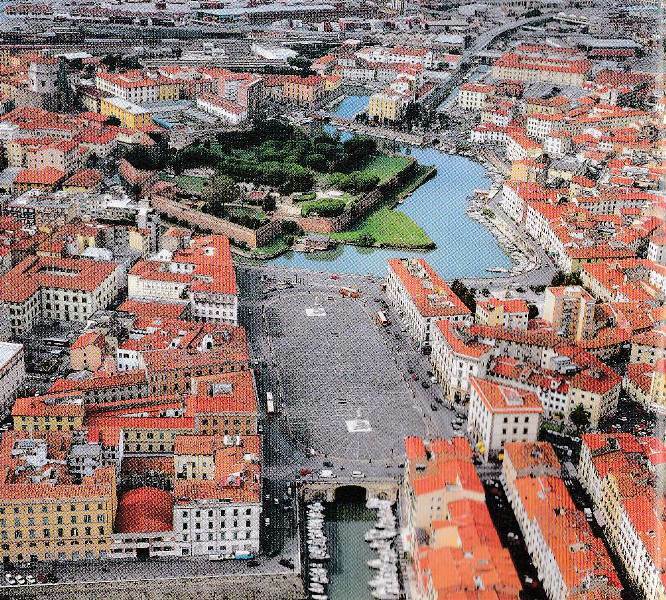 Livorno is one of the calls in the Mediterranean Sea for people who come from all over the world - Canada, the States, Australia, New Zealand, North Europe, Japan - to spend a few weeks on board of beautiful ships and want to visit the countries overlooking the sea. It was such a great occasion for students to practice the language, to exchange ideas with people generous of their English and who appreciated our "beautiful program", they said. To continue practicing, upload a comment about the morning with cruisers or the whole Summer course and keep in contact with your mates. How did the course help your English? Why did you find it useful? What did you like most? Activities, dialogues, oral and written onto papers on the walls, stories built following pictures cut from magazines, written and narrated to win a prize: English books, to continue the experience and improve the language. Useless to say that all the students had a permission signed by their parents for being photographed and for the photos to be published coherently with the aims of the English training course. Thank you all for participating, it has been great working together! Thank you Giuliano for your comment. Each one of us should feel part of this little planet we live on and protect it, that means caring for the past, present and future. The Mediterranean is this magnificent common sea - Mare Nostrum - that gave all of us living around it the same identity, we all belong to this common "land" that produced unforgettable history, culture, art, civilization to be shared and spread. All the times someone interrupts this flow everybody should ask themselves why, what has gone wrong, since there are so many responsabilities, and each one of us might not be excluded from having some. Continue writing about your journeys around the world, it is a great pleasure reading. Thanks once more Giuliano, for one more comment. Each one of us is a mine of feelings, a special lens to read the reality. All the times we feel anger, hatred, we should wonder why and find the answer. By the time we have the answer, our feelings would change, would be more mature, productive and useful. Destroying the remains of ancient cities means to cut the threads that keep us linked to the deepness inside ourselves. On the contrary, we all need them to understand which places we belong and continue the very long walking each one of us can contribute to, in order to leave something to those who'll come after us. We are developing projects about the Mediterranean, considering it a conmon area shared by so many different peoples with their different cultures, languages, behaviours, that are still in time to know each other and design a common humanism for a future to share. Good morning, afternoon, evening everybody! These are topics to talk about in class, to make our Summer English fresh and dynamic. What's more important to you comparing appearance and personality? What is your appearance? And your personality? Can you describe a friend's ones? 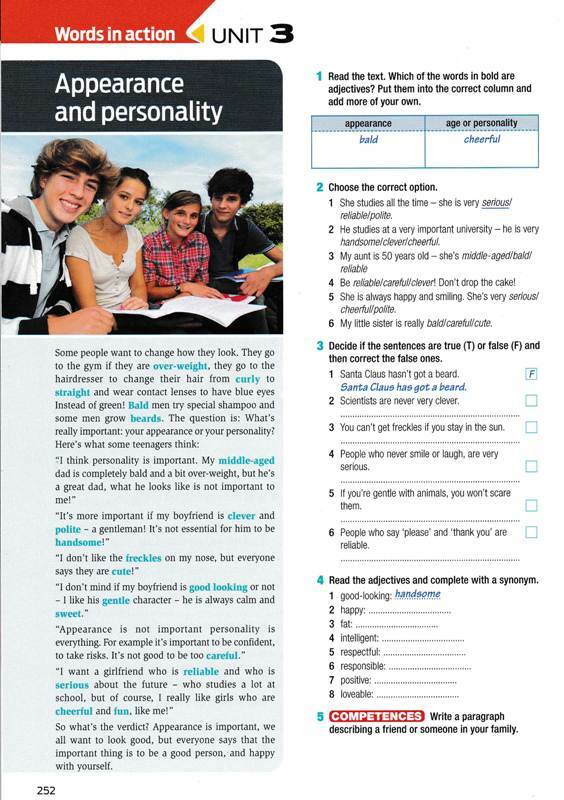 Try to guess what personality your mates in class have and ask them to do the same with you. Do you have different personalities? Can you think of yourself as an adult? What would you like to be like? Tell your mates and guess what they are going to be like. See you in class and "In the Open Air"! Thank you Claudia for your comment. Do not forget that people is plural, a collective noun. When with s means for example European peoples, meaning the French, the Italian, the German etc. ones. Continue being determined and serious, we do appreciate so much seriousness and determination. Matteo, Davide, Giuseppe, Gabriella, Lorenzo, Francesca, Damiano, Summer English second group. 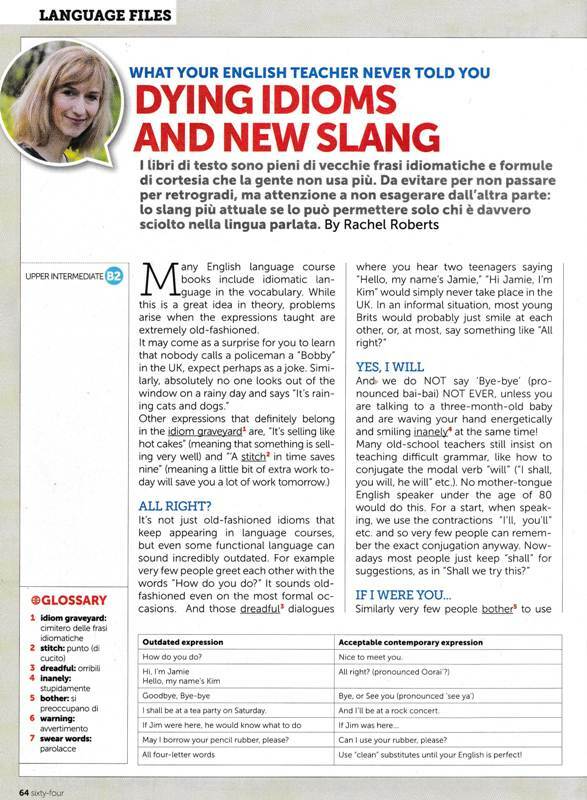 You are all very welcome to our Summer English, a collaboration between ITI G. Galilei Livorno and us. We would like to invite you to practice English and enjoy yourselves having fun with your classmates. You have two pages here to read and a few questions to reply as a comment below. Before you read, look at the title. 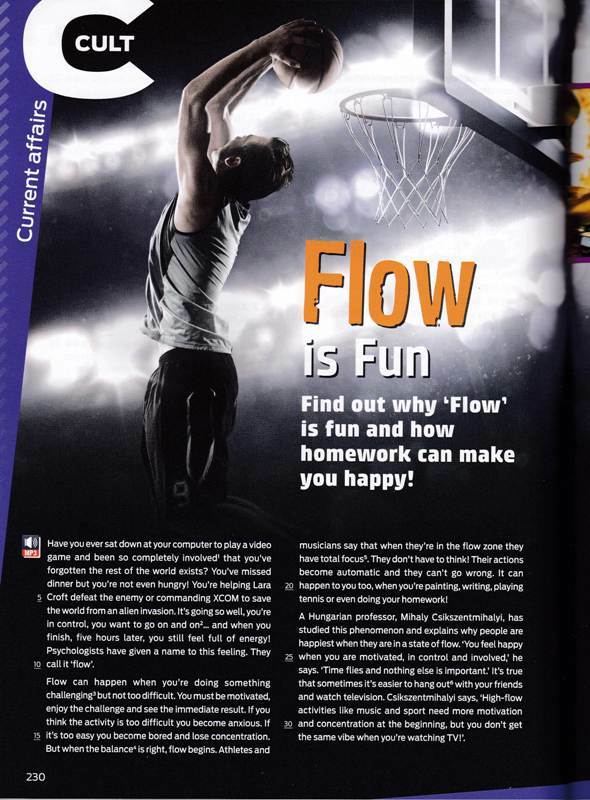 What do you think "flow" is? After reading, as groups, talk about flow. 1. Make a list of the different activities you do. Are they high flow or low flow? Which do you prefer? 2. Have you ever had a flow experience? If so, when? 3. Do you know any Italian artists who do flow? So do I. / I don't. Paola: thank you Paola, for your comment and the information about you. Here's a list of possible improvements for your comment. Here's my text; people like appearing; It depends; context; rather calm and reflective; I seem joyful and funny; I often tried; personalities; young people, no article; being on many diets; practice/play sports to be fit. Manicure: continue reading our pages and leave comments! the special squirrel we are talking about is the one in a poem written by the Turkish poet Nazim Hikmet in 1948. Life is not a joke/take it seriously/as the squirrel does, for example/without expecting anything/ from the outside or in the hereafter./You won't have to do anything else than living.//Life is not a joke./Take it seriously/but seriously to the point/that put against a wall, for example, hands tied/or inside a laboratory/ with a white coat and big glasses/you die so that men can live/men whose face you won't ever know/and you will die knowing/that nothing is more beautiful, more real than life.//Take it seriously/but seriously to the point/that when seventy, for example, you will plant olive trees/not because they have to be left to your children/but because you won't believe in death/even if fearing it/and life will weigh more on the scale. We do believe this squirrel is quite wise. Shall we imitate it and try to be as wise as it is? That's why, undeservedly, attempting to find this wisdom somewhere, one day we met a squirrel while driving along a country road where we started writing about it. This book is aimed at promoting cultural issues, civil and human rights, through the NPO Eurocontact Plus Onlus we funded. At this stage, the book tries to support all its efforts, initiatives and projects, to spread bi/multilingualism as a lively common citizenship to share, and to encourage all possible forms of art underlying in young people, creating work for them. It is a collection of texts aimed at sharing meaningful feelings. We would be very pleased if you left your comments here. If you want to help us and know more about our work, this book is for you to buy, as a donation to the NPO Eurocontact Plus ONLUS whose IBAN code is IT47 Z076 0113 9000 0101 9775 509; we will send it to your address, as soon as we receive your communication via email - see bottom of the page - with your address. If the coordinator of the website is your English teacher, you can ask her directly and you will have the book with a discount compared to the price it has on the Internet. You can also donate your 5 per thousand on your tax return; the fiscal code is 92121150491. Useless to say that any donation to Eurocontact Plus ONLUS is very welcome and will be fruitful as an investment on the so many projects we are working on. Let us know in case you want to know more and partecipate. It would be very nice of you reading the book and writing a comment about some texts you like. can you see from the photographs what we are referring to? We are going to visit the place and the surrounding area with English students on Monday the 8th of June, getting together at 3,00 p.m. with the first group and 4,30 with the second one in Piazza del Municipio, just under the board showing directions for New York, London, Madrid, and quite nearer cities in Tuscany. 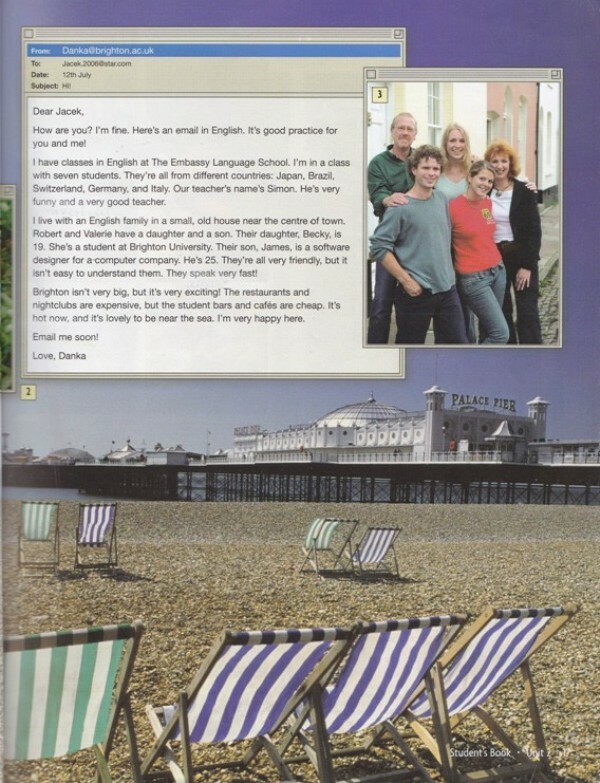 It would be a pleasure meeting you too, in case you like to join us, to practice English and welcome whoever does the same. Please be punctual. While we are going to give you the booklet from which we took the last photograph below and information to consult for answering these questions, here they are for you to reply. The aim is to develop the skills of written comprehension from the text given, and to reemploy and rephrase it in formally correct structures, both in writing and speaking. What are the two fortresses in Livorno called? Have you ever been on a boat trip along the canals in Livorno? Would you like to sight-seeing Livorno from the canals? Thank you Natalia, you know then what we mean when we say our city is fascinating. Come and visit it again!